November 6th at The Conrad on Fort Lauderdale Beach, business professionals gathered to discuss Fort Lauderdale as a premier location to work, live and visit. Jenni Morejon, CEO of the Fort Lauderdale DDA, opened the event and explained how the city has evolved and what the DDA is doing to preserve, enhance and promote it. The first panel (pictured left) discussed how Fort Lauderdale has become a 24 hour city, different from what it was twenty years ago. The city has an active nightlife and continues to attract more residents and tourists. "No longer a city between two cities" said Scott MacLaren, President of Stiles. They also brought up Dania's growth as an adjacent part of Fort Lauderdale and even a destination of its own. Chris Gallagher of CBRE stated how the Brightline allows for exposure to a larger labor pool in the tri-county area which is optimal for employees and employers alike. 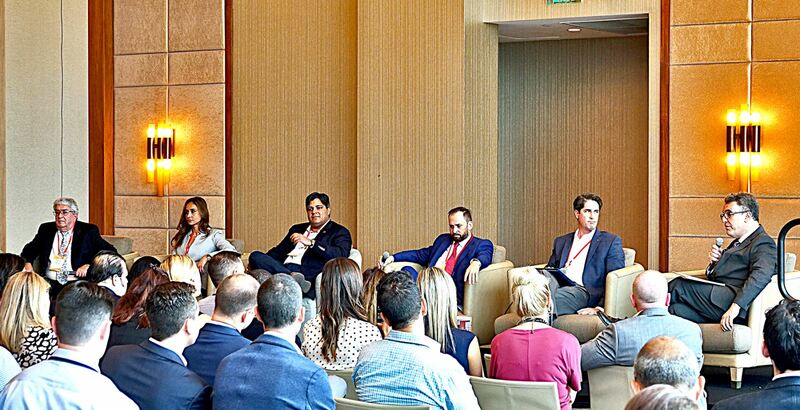 The second panel (pictured right) explained how branding and marketing changed the way residents and investors view different Fort Lauderdale neighborhoods and how vital it is to connect these areas. Sherif Ayad, President of ID & Design, explained how the city has diverse neighborhoods where progress and business cycles fluctuate independently. Jeff Burns, CEO of Affiliated Development, stressed the need to make transportation and other city amenities accessible, housing affordable and the infrastructure stronger. Also mentioned was the utmost importance of finalizing the Brightline Train Station which will lead the city into the next decade. Overall the city continues its expansion and upward economic growth. 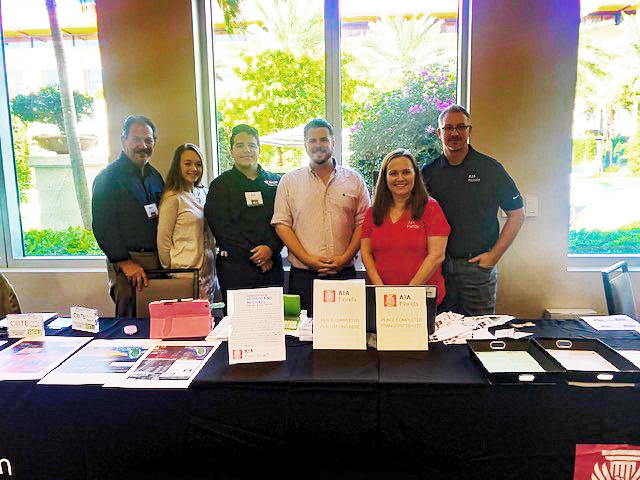 As a new member of the AIA Palm Beach Chapter, Thompson Architectural Products is glad to have co-sponsored and attended the 2018 Build Palm Beach Conference, held on October 18th at the Hilton West Palm. We witnessed first hand an excellent attendance and networking. Thank you Denise Bas-Arzuaga, President of the local chapter, for taking the time to meet us and advise on available opportunities for members. Tiery Boykin, President-elect, also spoke at the annual meeting. He encouraged membership participation, explained the strong financial health of the board's budget and stressed the importance of the association in maintaining high standards and professionalism in the industry. 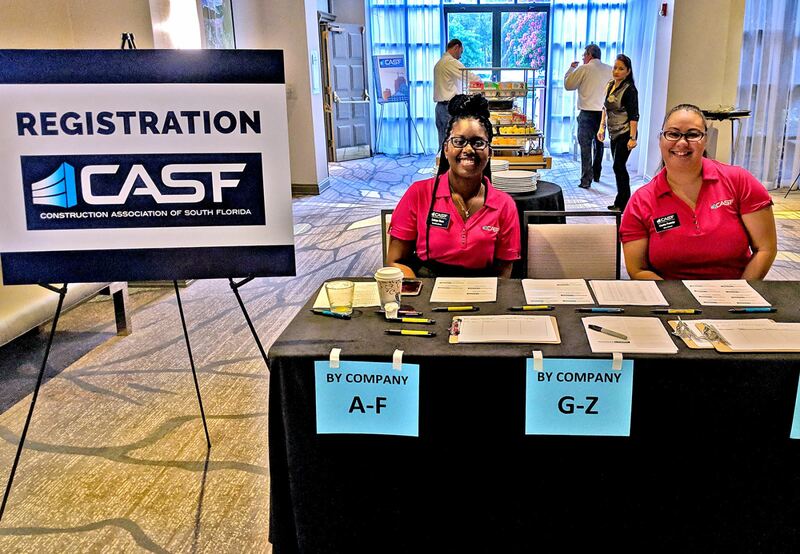 Special kudos to Becky Magdaleno, Executive Director, and George Henning, Member Services Manager, for their collaboration in the event while enduring the aftermath of Hurricane Michael in their home city of Tallahassee. ThompsonAP co-sponsored and attended Steve Jobs: The Lost Interview held on October 1st at the Junior Achievement World Huizenga Center in Coconut Creek. The audience was treated to a presentation by Jeff Tobe as he examined an unknown interview of Steve Jobs and held open discussions with the audience. He stressed the value of employees, processes of innovation, and invited everyone to think outside the box. 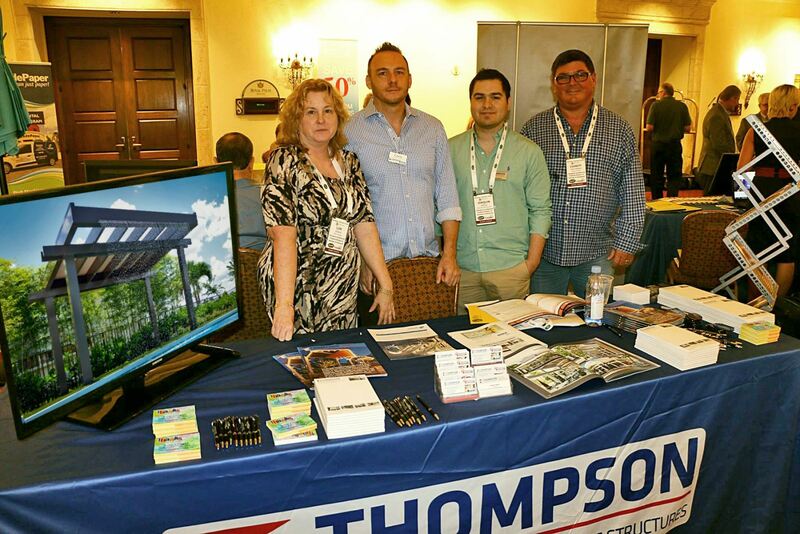 ThompsonAP recently co-sponsored and attended Meet The Architects on September 27th at Boca Raton Marriott at Boca Center. 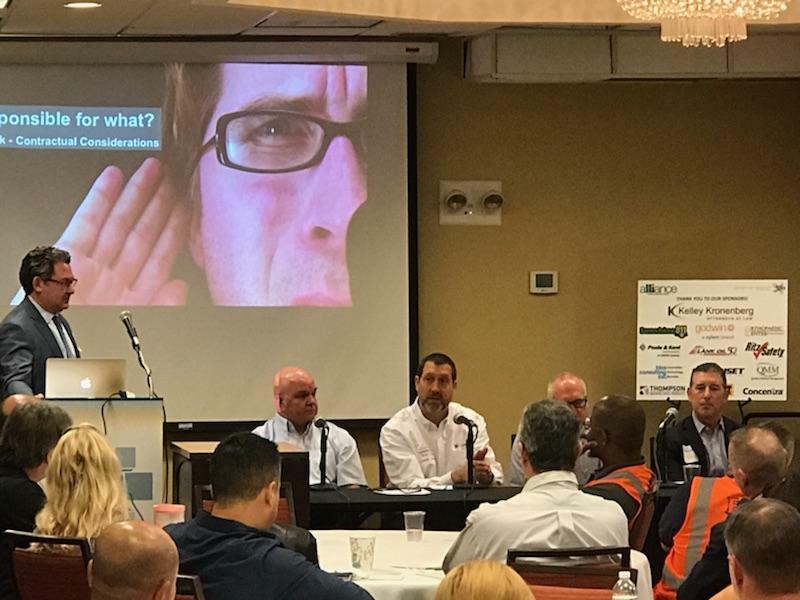 The event involved seasoned architects from various areas of the industry who discussed everything from improving relationships with owners, contractors and vendors to technology and future projects. Thank you Construction Association of South Florida (CASF) for your collaboration and organizing this event. 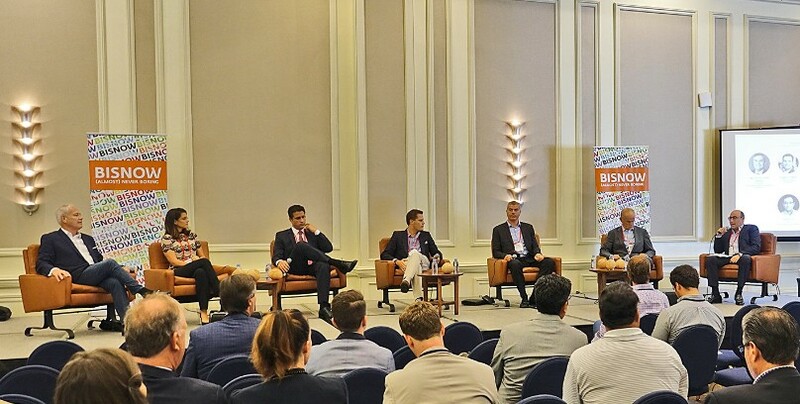 The Caribbean Hospitality Investment Summit, held August 23rd at the InterContinental Hotel showcased an array of panelists composed of industry professionals from tourism and hospitality to development and financial investments. The first panel discussed how Puerto Rico rebuilt after the devastation of last year's hurricane Maria, leading to a stronger infrastructure. There is now an increased focus on creating business opportunities and encouraging tourism growth. Existing businesses have been undergoing renovations to expand their room inventories as well as offer more luxurious amenities. Investors and residents can benefit from tax incentives due to congress declaring the territory an Opportunity Zone and Acts 20 and 22. Panel 2 included developers, financiers and an architect. Points were made on respecting the ecosystem, stressing energy efficiency, and modernizing the infrastructure in the Caribbean. The message: resiliency and sustainability. The last panel was composed of executives from the hospitality industry. Their companies are expanding throughout the different islands of the Caribbean with a focus on the introduction of all-inclusive resorts. Also noted was the relationship between the financial health of the US economy to that of the Caribbean economy. ThompsonAP was a proud co-sponsor of the West Broward Neighborhood Report Event. This event provided an opportunity for business professionals to network, discuss, and learn about what cities will experience the most development in the next five to ten years; how these cities will adapt to the predicted commercial and residential development; what impact the next market correction will have on Broward County's economy; and consumers' behavior since the last recession. They discussed the county's readiness for the next market correction. 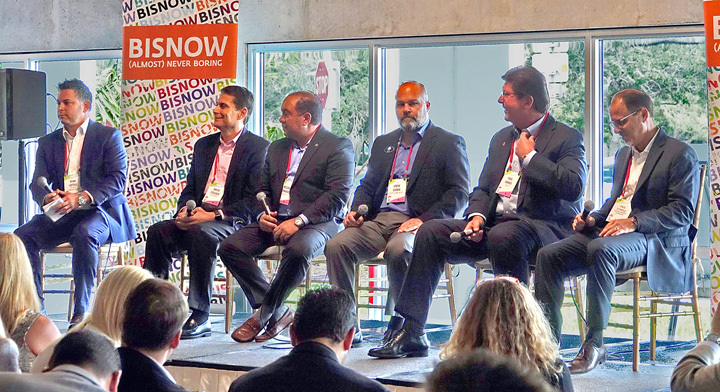 Some panelists said that there could be a slowdown while others were confident that investments, transportation, entertainment centers, and multi-use properties will help the market maintain momentum during any future corrections. Panel 1 discussed market trends and investments in West Broward. As communities have developed past University Drive, commercial niches have bloomed in key points of interest. Quiet residential neighborhoods have business plazas that offer a variety of hospitality, services and entertainment. The developers and contractors on Panel 2 discussed what cities in West Broward would experience the most change and its effects. Paul Marko pointed out that the price per square foot has been rising fast and steadily, which encourages developers to maximize the use of available space. One byproduct of this type of growth would be traffic, and even more so parking. Erick Collazo explained how he has seen a rise in the trend of "lock and leave" residences where people move from a large home to a small apartment allowing for travel. Residents want multi-use properties with amenities. 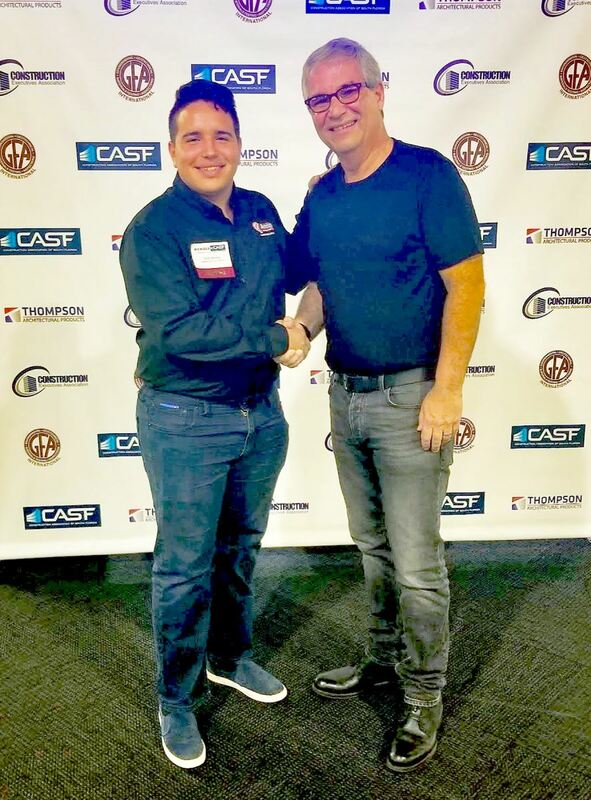 The Thompson Team recently co-sponsored and attended the 2018 CASF Safety Expo at the Marriott Fort Lauderdale for a panel discussion on Hurricane Preparedness. It was a productive event with a lot to learn from panel members Steven Osber of Kelley Kronenberg, Peter Juhren VP at Morrow Equipment, David Lockhart of Poole & Kent, and Ryland Thompson of Marsh & McLennan. The moderator was Brian Trusky from Coastal Construction. The panel unanimously agreed that businesses should address their insurance coverage well ahead of the hurricane season as part of their preparedness process. Owners and risk managers may assume their businesses have more coverage than what actually exists. These assumptions can lead to under-protection. Also, the window of opportunity to get insured for floods and hurricane damage shortens each year. They suggested to verify the terms of your policy with your lawyer. Each panel member agreed that preparing for hurricane season should be done prior to the start of the season. Resources are usually less expensive and there is more time to plan. In contingency planning, one of the most important resources to protect are the employees. This includes methods of communication and storm preparedness. Who maintains and implements the hurricane plan for the company? Hurricane preparedness goes beyond surviving the storm - we must plan to succeed in business afterwards. 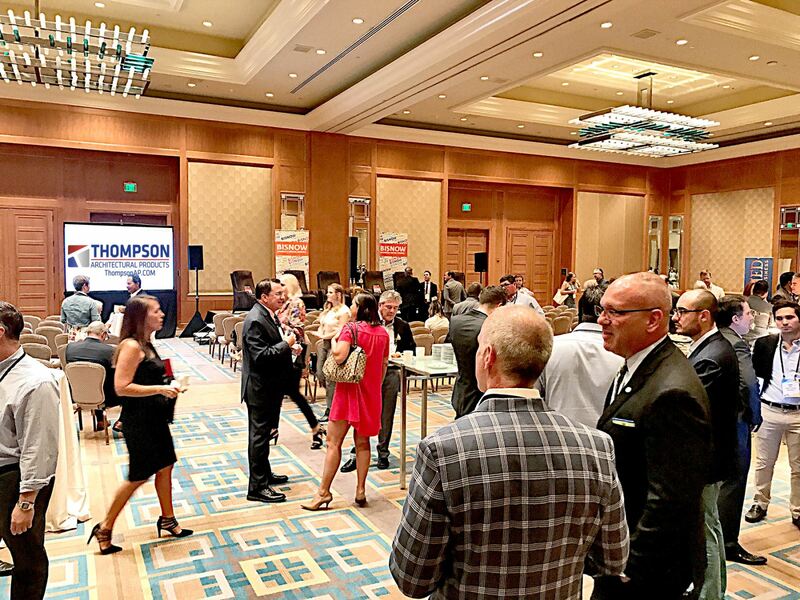 The Thompson team recently attended and co-sponsored BISNOW’S The Future of Downtown and Miami’s Urban Core event at the Four Seasons on Brickell in Miami. Nitin Motwani, the managing principal at Miami Worldcenter Associates; Reinaldo Borges, principal at Borges + Associates Architects; Louis Birdman, co-developer of the One Thousand Museum; and Andrew Frey, the principal of Tecela are a few of the panelists that discussed developing and modernizing of neighborhoods near the downtown area to attract and maintain businesses and residents. Also a featured panelist, Dave Howard, the CEO of the Brightline, enthusiastically outlined the rollout for the upcoming higher-speed rail system. Brickell, Little River, Downtown, Little Havana and many other areas offer a depth of culture and a variety of business opportunities. The panelists explored incorporating unique accents across the original platforms of the areas. Accessible transit, physical proximity to work and residences, and safety are influential in ensuring the overall success of a neighborhood. Alicia Lamadrid, managing partner at Cervera Real Estate explained that people tend to search for a safety factor when choosing their future homes. The prosperity of a neighborhood also needs the participation of its residents to aid in the revitalization of the financial and overall growth of their communities. In the high-density areas of existing neighborhoods, Jon Cardello, senior principal at Stantec Architecture and Design, mentioned that micro housing could be considered. The micro housing concept is known as a self-contained living space designed to accommodate all components of housing, but in a much smaller area. Borges stated that it is also important to ensure that new building structures have resiliency and can adapt to their everchanging environments. Dave Howard previously involved with the sports management industry, revealed that the Brightline was not just a transit project but also a hospitality and financial opportunity for the surrounding communities. The Brightline is expected to create an attraction within itself and become an experience that one would not forget. The Miami Central Station is an investment in Miami’s future of transportation and economy. Intermodal connectivity is very important as well so there will be connections available for Miami’s metro rail, trolley, metro bikes, and other ride share services. The station will be in the heart of downtown and contain residences, offices, and other retail and entertainment experiences. 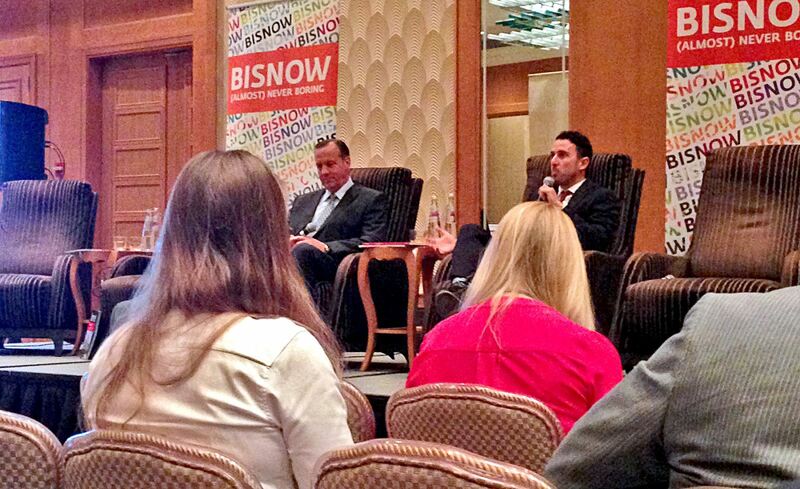 As always, these BISNOW events provide an ample networking opportunity. 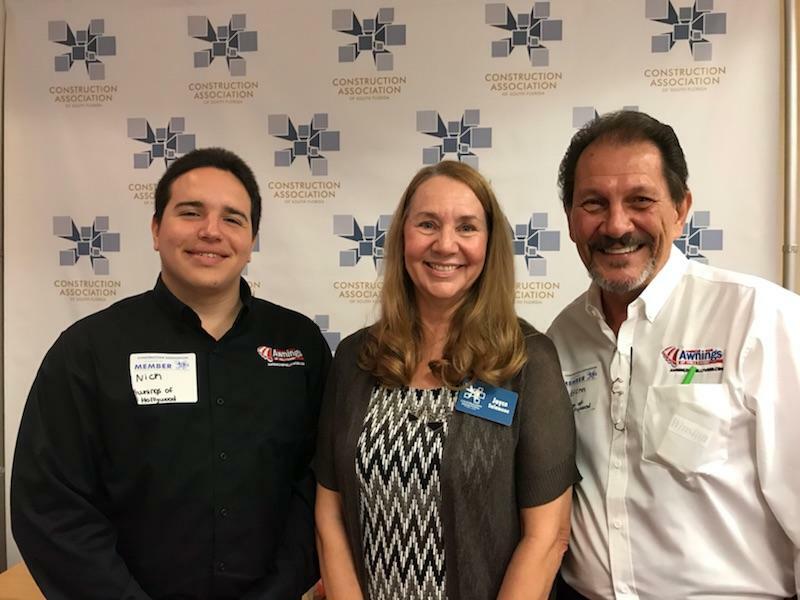 Manual Maldonado from Bayside Marketplace; Mark Anes with Coastal Construction; Richard Worth with BuildingLink.com; Modesto Millo from Kast Construction; and Brian Fearnett from Lulafit Concierge Fitness are just a few of the attendees that the Thompson team had the pleasure of meeting. Has urbanization become the new American Dream? 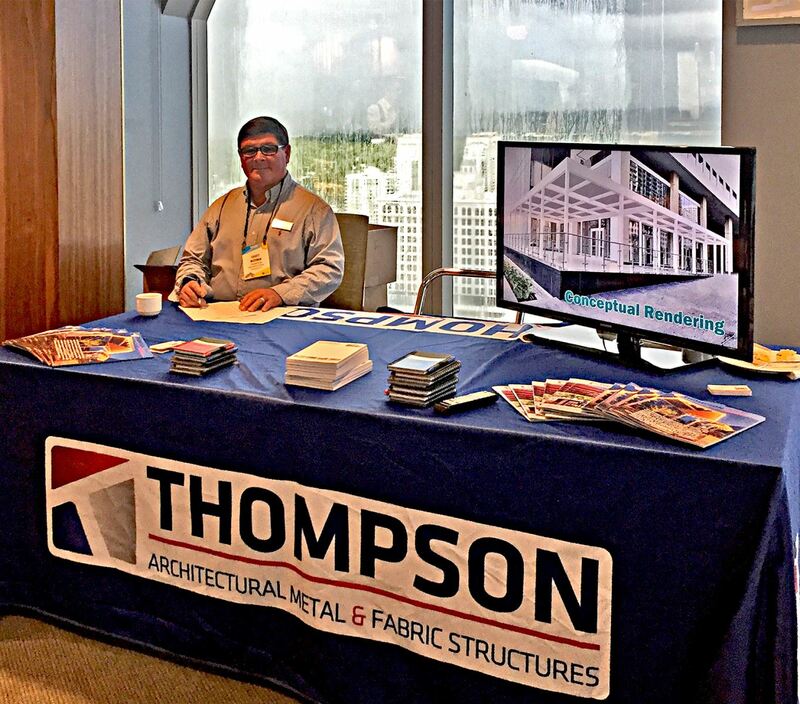 Thompson Architectural Products recently attended BISNOW'S The Future of Fort Lauderdale event at the Tower Club. One of the main topics discussed was creating a balance between the increasing influx of residents, transportation, and mixed-use real estate. How can Ft. Lauderdale support its growth in the most efficient and productive way? Among the speakers that attended the event were J. David Armstrong Jr., President of Broward College; Lee Feldman, Ft. Lauderdale's City Manager; Angelo Bianco, from Crocker Partners; and Tony del Pozzo, The Related Group. Each of the discussions went hand in hand with goals focused on ensuring that Fort Lauderdale will be the place to invest, build, live, work, and enjoy. Everyone wants to live in the center of town but unfortunately affordable housing in Ft. Lauderdale is limited. Some of the panelists stressed that certain regulations have been established which make it more difficult to provide affordable housing to the area. This discussion led to a deliberation on transportation methods as discussed by Jack Stephens, executive director of the South Florida Regional Transportation Authority. He mentioned the new and upcoming Brightline, a higher-speed inter-city rail service that travels to Miami, Fort Lauderdale, West Palm Beach, and even Orlando. Improving transportation systems could possibly be the next step in helping with the revitalization of the economy of the city. J. David Armstrong Jr. outlined that the downtown campus was in dire need of updating and renovation. The college did not receive enough funding from Tallahassee to more forward, however they are in the process of finding new avenues of additional financial support. Networking was vivid. In addition to having the opportunity to meet with some of the panelists, The Thompson Team had the privilege to speak with, among others, Felipe Calderon III and Eric Kalis from Boardroom PR; Ali Hanes, P.E. at Kimley-Horn; Zack Haigney from Kimco Realty; Roger Simon, a project geologist from Langan; Dennis Lemons, from Craft Construction; and Dominick Ranieri, from The Martin Architectural Group. 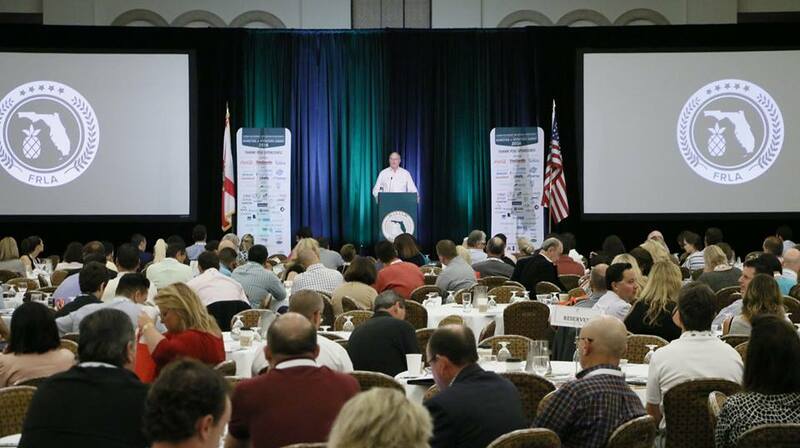 The Thompson team attended the FRLA Marketing and Operation's Summit at the Boca Raton Resort & Club on July 27th-28th. Exhibitors and Attendees alike visited our booth to learn more about how Thompson can help them enhance their brand, improve curbside appearance, and maximize their outdoor space! FRLA provided knowledgeable and entertaining speakers as well as educational sessions about utilizing marketing resources, the effects of tourism on the industry and important laws for owners, managers and much more. Kelly Frailey Covato, Client Partner with Global Marketing Solutions, discussed the importance of social media and business. She mentioned that Facebook and Instagram usage together was greater than the usage of all other social media apps combined. She provided key tips for advertising on Facebook and Instagram to make sure a video has "Thumb Stopping Material". Think mobile and deliver an immersive story. Scott Stratten, the "Un-Marketing" guru, through his humor and captivating personality, brought a reversal of the traditional advice many businesses are told regarding social media advertising. Focus on your foundation first! Positive customer experience is essential. When a business stops focusing on the small but important details, it could experience decline regardless of social media efforts. Don Yaeger, Business Leadership Coach, talked about the importance of teamwork and the high-performing habits championship caliber teams all have in common. He poignantly described his interview with Coach K, the coach of USA Men's National Basketball team, who stated the first step to building a great team is to help the team members understand the Why or Purpose of their individual and team roles. Thompson extends a big THANK YOU to Marjorie Stone and her team for organizing this notable event! The Florida Restaurant and Lodging Show held at Orlando's Orange County Convention Center was a major success. The atmosphere of the show was astounding from the second you entered, instantly feeling the energy of all 429 exhibitors and the several thousand guests. 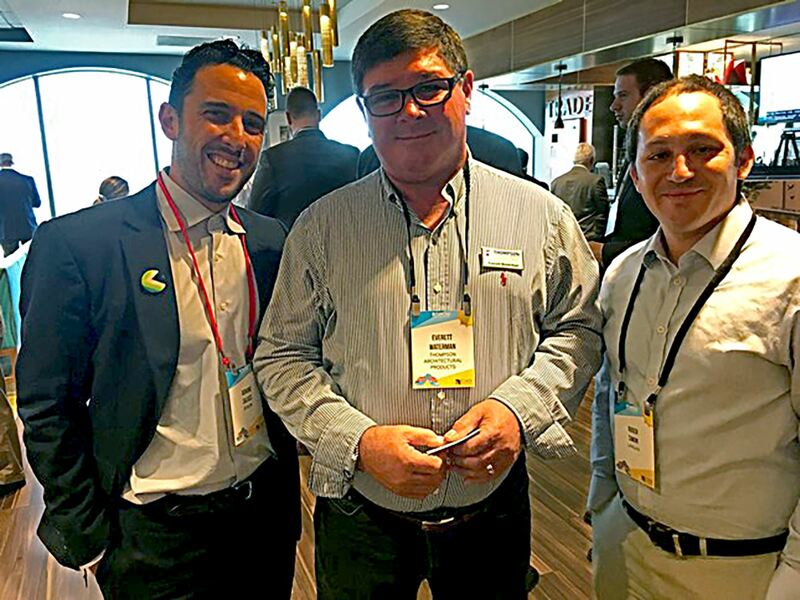 Everyone was able to network with the main decision-makers in the restaurant and hotel industries and be informed about future projects and goals. Each restaurant’s food presentation was unique and exotic. One of the many seminars, “5,000 Fans, Now What? 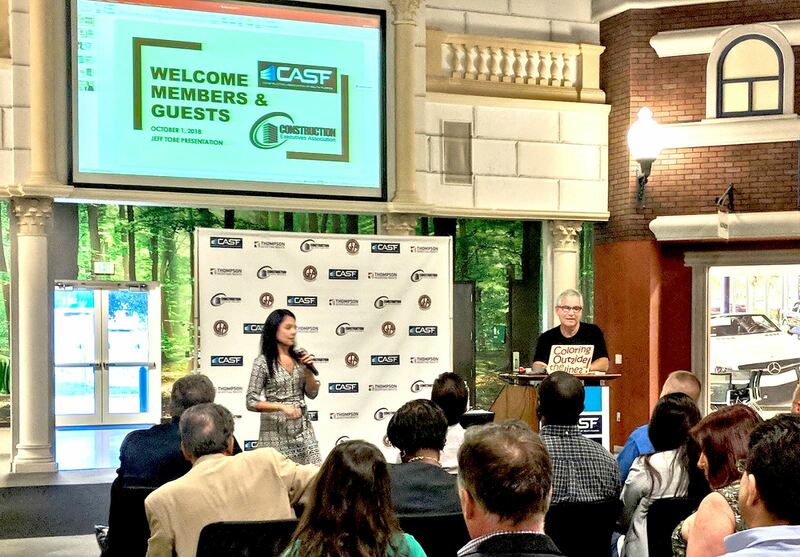 - Use Facebook as a Business Investment Tool” hosted by Patrons+, speaker Kyle Taylor informed the attendees that any content posted adds value for hospitality customers and fulfills their needs to some degree. Once that has been accomplished, loyal customers’ “likes” will turn into revenue. 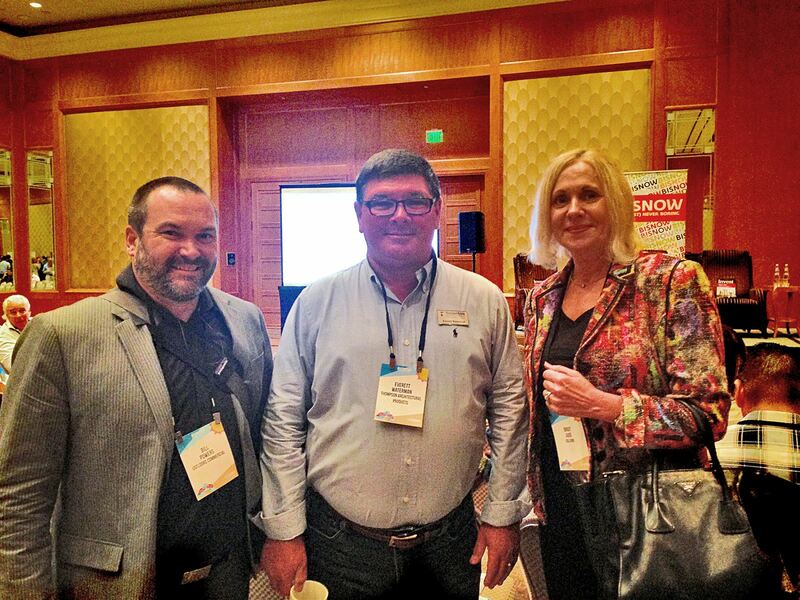 “We are thrilled with the success of this year’s Florida Restaurant and Lodging Show. From insightful education to palate-pleasing food and drink trends, attendees were able to experience the best in the hospitality business. We are always proud to participate in such a fantastic event that is continuing to grow and to celebrate alongside our wonderful colleagues who help make our great state a wonderful place to live, work and play.” said Carol Dover, President and CEO, of the Florida Restaurant and Lodging Association. Our Thompson Architectural Products team of professionals was able to showcase our Retractable Roof Systems, Thompson All Weather Shades, and Outdoor Heating and Fan accessories. 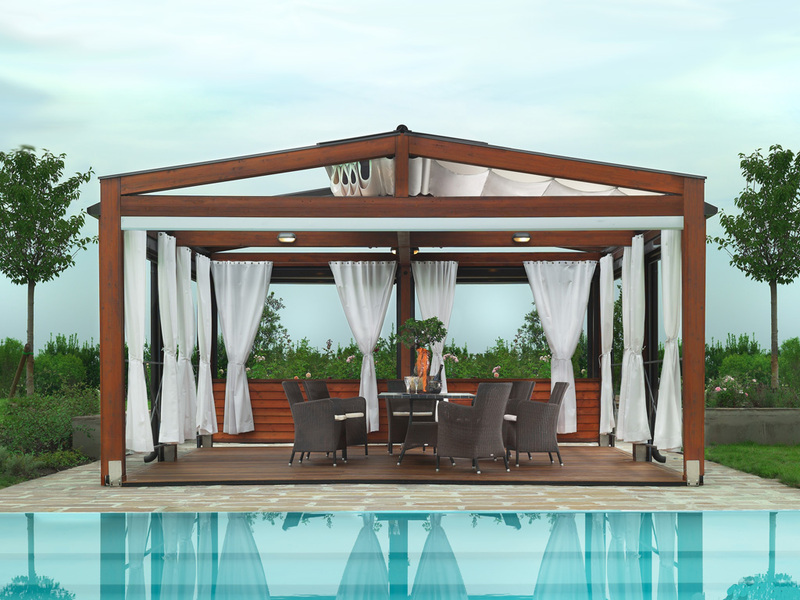 These systems stole the show and became the most talked about products to expand outdoor seating and maintain comfort for hotel and restaurant patrons. 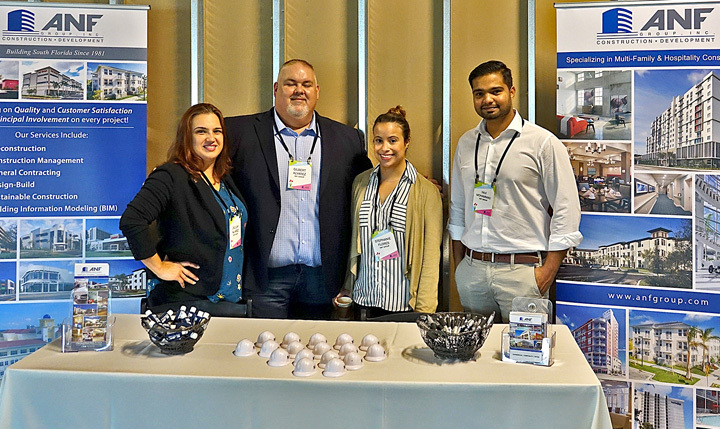 The show provided some fun learning activities, a plethora of free samples and drinks, but most importantly provided an all-encompassing venue for vendors and attendees alike. See you next year! At their 2015 banquet, The Florida Chapter of the Paralyzed Veterans of America presented Awnings of Hollywood’s owner and President, Jerry Thompson, with a Certificate of Appreciation for donating and installing a new awning cover to the chapter. Juan Perez, President of PVAFL expressed, “ It is not very often that a contractor is called to provide an estimate…and be told that the job will be done at no cost….He surprised us when he said Awnings of Hollywood would donate it to the Chapter”. The Paralyzed Veterans of America’s Florida Chapter, a nonprofit organization, is located in Fort Lauderdale. The membership encompasses Monroe, Dade, Broward, Palm Beach and Martin counties. Their mission is to provide services and assistance such as adaptive sports and recreating activities, ensuring quality health care as well as advocacy and education programs for and about veterans with Spinal Cord Injury or Dysfunction (SCI/D). To learn more about the organization and to give back to those who have given so much, visit www.pvafl.org. Whether at a business or individual giving level, monetary or otherwise, Community Involvement and Social Responsibility is a win for everyone. 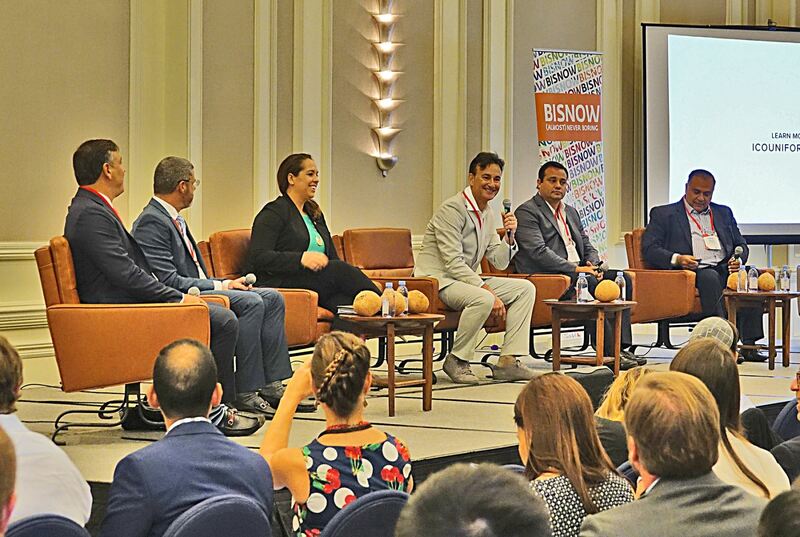 Thompson Architectural Products sponsored a recent Bisnow hosted event called " Miami's Restaurant, Retail, & Hospitality Renaissance" on May 14th 2015 at the 1 Hotel South Beach. Attendees such as designers, architects, and restaurant vendors were able to enjoy breakfast, listen to a lively panel discussion and partake in a Q&A, and network. The panelists varied from Jessica Goldman Srebnick, CEO of Goldman Properties, and Richard Miller, CEO of Trust Hospitality, to Executive Chef Diego Oka of La Mar by Gaston Acurio and Joel Pollock and Leticia Ramos Pollock the owners of Panther coffee. 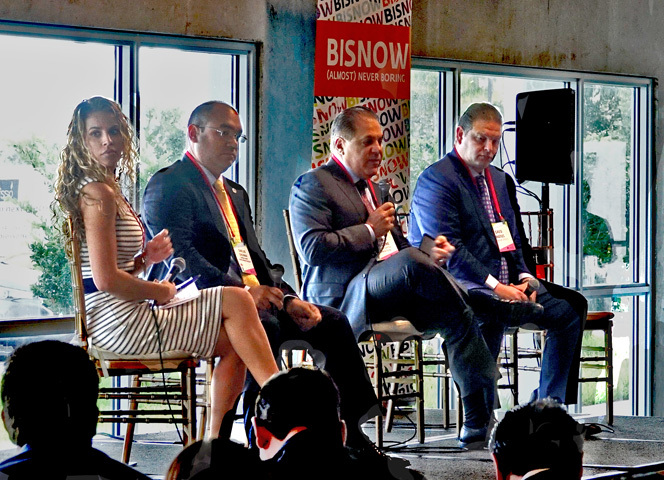 Topics discussed among the panelists included market trends in Miami, expected business growth, and the overall attraction of Miami as a destinations for their patrons. 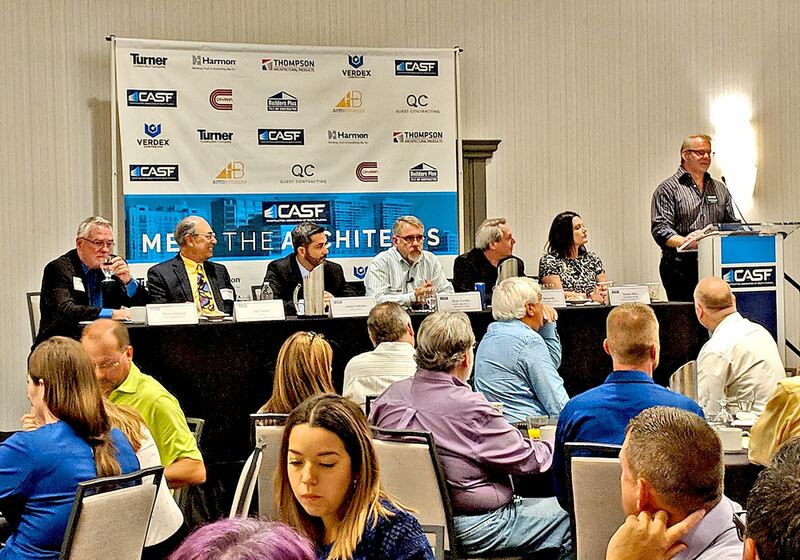 On May 19th 2015, Thompson Architectural Products sponsored an event called "Meet the Developers" held by the CASF at the Courtyard Marriott in Fort Lauderdale. 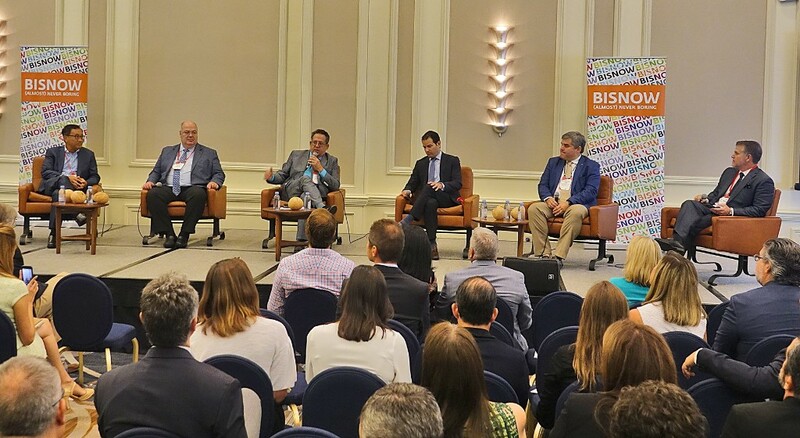 At this yearly event, CASF members and guests had breakfast provided while listening to a panel of executives and directors who play an integral part in construction and development of South Florida. Topics discussed among the panel members were trends, major contentions with contractors, projects on the horizon, and how to establish a business relationship with their firms. We are proud to have sponsored an event that provided esteemed panel members such as Malcolm Butters President and Co-founder of Butters Construction & Development, Mario Cabrera a Professional Engineer for the Florida Department of Transportation, Ron Choron VP of Construction for Fortune International Group, Shelley Meloni Executive Director for Facilities Design and Construction of Broward County and Matt Ellish of PMG. At this year’s AIA (American Institute of Architects) Florida Convention, held at the Trump National Doral Miami on July 18th, Thompson Architectural Products/ Awnings of Hollywood had the opportunity to host a booth for distinguished architects from Florida, the Caribbean, and around the country. The convention’s goal was to foster community among architects and the wide variety of contractors and subcontractors, allowing for advantageous networking for future collaboration. In addition to conversing with other representatives, such as Jim Driggs from Ferrari, a major fabric manufacturer, regarding their current projects, our representatives enjoyed presenting our various products: canopies, retractable awnings, metal roofs, weather curtains, solar shades, pergolas, and more. The trade show was truly educational as our fellow exhibitors provided information about other products that we can pursue for incorporation into our Design-Build Program in the future. We are excited to see what the next year will hold! “Only about 5 percent of the companies Awnings of Hollywood competes with in South Florida are able to earn our Super Service Award,” said Angie’s List Founder Angie Hicks. “It’s a mark of consistently great customer service.” Angie’s List Super Service Award 2013 winners have met strict eligibility requirements, which include an “A” rating in overall grade, recent grade, and review period grade; the company must be in good standing with Angie’s List, have a fully complete profile, pass a background check and abide by Angie’s List operational guidelines. Awnings of Hollywood is sponsoring the raffle at the CASF Spring Social event on Thursday April 24, 2014 at the Humane Society. 100% of the raffle proceeds will be donated to the Humane Society. Awnings of Hollywood designed and installed the new Bahama Shutters at the Humane Society as part of the recently completed renovations by The Marker Group.